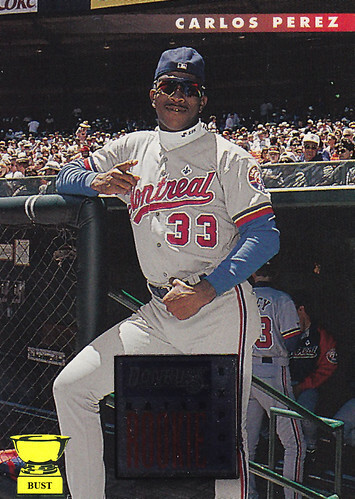 Donruss photographer: "So, what do you think of this shot?" Donruss editor: "Well, where do I start ..."
DP: "So you like it?" Editor: "No, I don't like it. I don't like the shot and I don't like the guy." DP: "Carlos Perez is one of the hottest rookies this season." Editor: "I don't care. This guy is breaking every rule in the book." Editor: "Like his backward hat. This isn't a home run derby. This is the national pastime." DP: "C'mon, he's just having fun." Editor: "Fun? You call those late-1980s Oakley Blades fun? This guy's a pitcher for chris'sakes." DP: "He's a character. We should embrace him." Editor: "Embrace him? He's pointing a finger gun at the camera. Who is this guy?" DP: "He's the youngest brother in the Perez family. You remember Pascual and Melido, right?" Editor: "That's exactly my point. He's a fool, just like his brothers. He's wearing a mock turtleneck on a hot day. He's all style, no substance." DP: "That's part of what makes this shot so memorable." Editor: "The only thing anyone is going to remember about this shot is the snake-like bulge twisting down to his knee." DP: "Well, this is the only shot of him I got." Editor: "Just cover up most of his junk with a big square and print this piece of crap."